There is still little evidence of any acceleration of wage growth. The Labor Department reported that the economy added 223,000 jobs in June. While this was in line with most economists' predictions, there were downward revisions of 60,000 to the data for the prior two months. This brings the average over the last three months to 221,000, compared to a monthly average of 245,000 over the last year. The job growth was almost entirely in the service sector as a gain of 4,000 jobs in manufacturing was offset by a loss of 3,000 jobs in mining. Construction employment was flat. The mining sector has lost 51,000 jobs (6.1 percent) over the last year largely due to the plunge in energy prices. The weak jobs number for construction is likely an aberration as the sector added an average of 25,000 jobs over the prior six months. Manufacturing added 215,000 jobs in 2014, but has added just 37,000 jobs through the first six months of 2015, due to the impact of the stronger dollar. The retail sector continues to be strong, adding 32,900 jobs in June. Insurance carriers added 8,700 jobs in June. This is likely a result of demand created by the Affordable Care Act (ACA). Employment is up by 161,000 (6.8 percent) over the last two years. Employment services, the broader temp sector, added 29,100 jobs in June. Health care added 40,000 jobs in June bringing its average over the last three months to 45,000. That compares to an average of 36,000 over the last year. Restaurants added 30,000 jobs in June, almost exactly in line with the average over the last year. Government employment was unchanged. Employment in the sector has been virtually flat since December. This report gives little hope for an uptick in wage growth. The average hourly wage over the last three months has risen at a 2.2 percent annual rate compared to the average over the prior three months. This is little different from the 2.0 percent rate of wage growth over the last year. 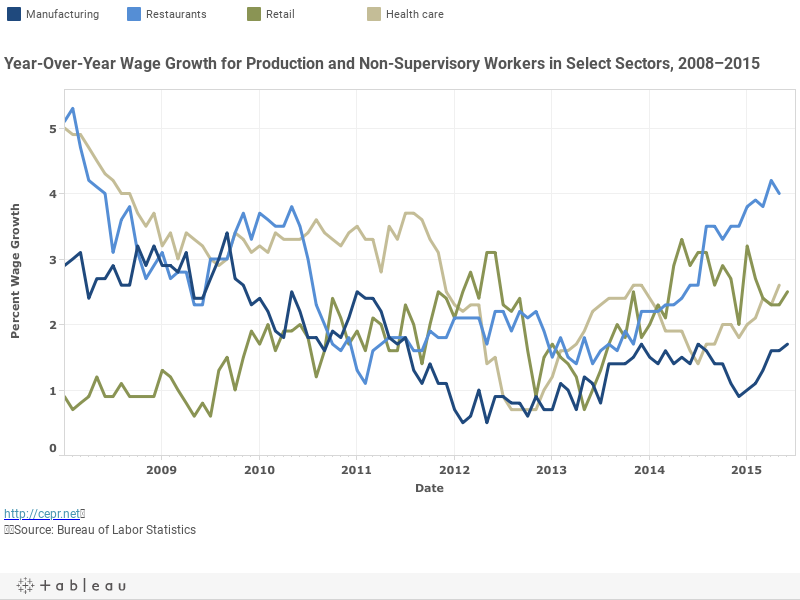 Among major industry groups, the only one that shows much evidence of an acceleration in wage growth is restaurants. This is likely to due to the effect of minimum wage hikes in many states and cities. The household survey also showed a mixed picture. The unemployment rate fell by 0.2 percentage points to 5.3 percent, the lowest rate for the recovery. However, this was entirely due to people dropping out of the labor force as the employment-to-population ratio (EPOP) slipped back by 0.1 percentage points to 59.3 percent. The one notable positive is that employment rates for African Americans seem to have risen, with the EPOP more than a full percentage point above the year ago level for the first half of 2015. The overall drop in EPOPs is consistent with the sharp drop in the number of long-term unemployed reported in June, from 28.6 percent to 25.8 percent of the unemployed, as many of these workers likely dropped out of the labor market. The June share is only slightly higher than the peak following the last recession of 23.6 percent in March of 2004. One clear positive is that the number of people voluntarily working part-time rose sharply even as involuntarily part-time employment fell. The number of people voluntarily working part-time is now more than 1.5 million above its level of two years ago, or 8.1 percent. At the same time, involuntary part-time employment is down by 1.6 million (20.0 percent) over this period. This is undoubtedly due in large part to the ACA, which freed workers from the need to get insurance through their employer. The share of voluntary quits among the unemployed continued to edge down to 9.3 percent. It had been at 10.2 percent in March. By comparison, job leavers accounted for over 12 percent of the unemployed in the peak months before the downturn and more than 15 percent at the peak of the cycle in 2000. This report together with the prior two suggests the rate of job growth may be slowing somewhat. While a monthly pace of 221,000 would be strong for an economy near full employment, with the EPOP for prime age workers still about 3 percentage points below pre-recession levels, it will take several years at this rate to eliminate labor market slack. Sign up here to receive email alerts for data bytes.